In celebration of the 50th anniversary of the National Historic Preservation Act, we will host the second year of a long-term research project investigating the lives of lumber workers in Michigan's northern woods. However, this is the first time our efforts will be run as a Passport in Time (PIT) project and, this year, we invite applicants to join us as we explore the Coalwood Lumber Camp! 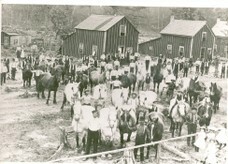 Coalwood was in operation from 1900 to 1912, and employed and housed as many as 217 timberman and their families, most of whom were of Finnish descent. PIT volunteers will gain (or hone) experience in proper archaeological field methods and artifact identification, and will be given a rare glimpse into what life was like for these historic lumber workers. The area also has much to offer in the way of sight-seeing, fishing, hiking, boating, and much more during your hours "off the clock." We hope you'll join us in August as we explore the past in Michigan's Northern Forest!